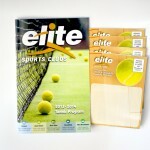 This is the 2013 Tennis Brochure that I updated for Elite Sports Clubs. I focused on making everything cleaner and more readable. 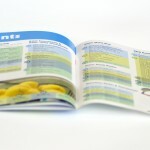 Organizing dates and times of programs and events between 5 locations. The most prominent aspect is the redesign of the location distinction style which is photographed below. I took most of the photography including the children who were photoshoped out and featured on multiple pages. QuickStart Tiny Tot (3 & 4 years old) Your child’s first tennis experience establishes a foundation for hand-eye coordination, basic movement, and athletic tennis skills. It’s a fun-filled introduction to the great lifetime sport of tennis. QuickStart I (5 – 6 & 7 – 8 years old) A focus on introductory rallying skills and beginning stages of cooperative tennis. Students will learn how to initiate a rally, how to move & judge a ball and racquet control. Future Stars I & II (10 – 14 years old) Future Stars will focus on drills that develop decision making skills, recovery, and movement. Students will experience situational and competitive play. 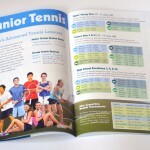 The development of an all court tennis player will be emphasized. High School Excellence I, II, & III. This program is specially designed for Junior Varsity & Varsity team members, teaching both technique and strategy for singles & doubles play. Enhanced teaching of specialty strokes and situational practice will be emphasized. Teaching of mental strategy will be introduced. QuickStart II (9 & 10 years old) Students learn basic tennis tactics & athletic skills while developing social skills & group attitudes. Students will be introduced to topspin & slice in point play and serves & return of serve. Super Young Stars (9 – 11 years old) Student will refine their technical and tactical skills. Singles and doubles concepts will be introduced. Ball control exercises that improve consistency, direction, and depth will be enhanced. 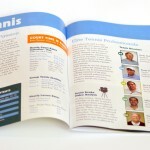 Hello, I am a graphic designer, problem solver and digital artist from Milwaukee WI. 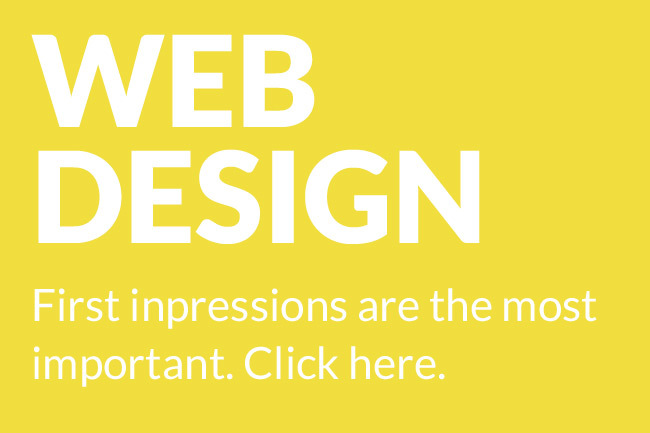 I'm currently hunting for challenging new freelance, graphic design or web design projects. Don't hesitate to contact me if you would like to discuss an idea. 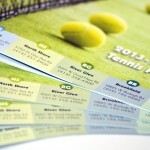 Filed Under Print | Tagged Brochure Design, Graphic Design, Print Design, Tennis Brochure. Bookmark the permalink. Good article, thanks. I just shown interest in your site rss.